For software developers, piracy is a rampant global problem that is made more complex by differing attitudes in foreign cultures as to the seriousness of the crime. When trying to confront infringers on their own, companies can make costly mistakes if they are not sensitive to regional cultures and laws. 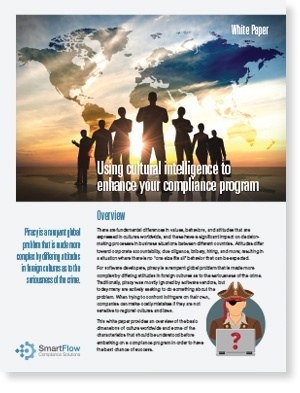 SmartFlow experts have developed this white paper to provide an overview of the basic dimensions of culture worldwide and some of the characteristics that should be understood before embarking on a compliance program if you want to have the best chance of success.